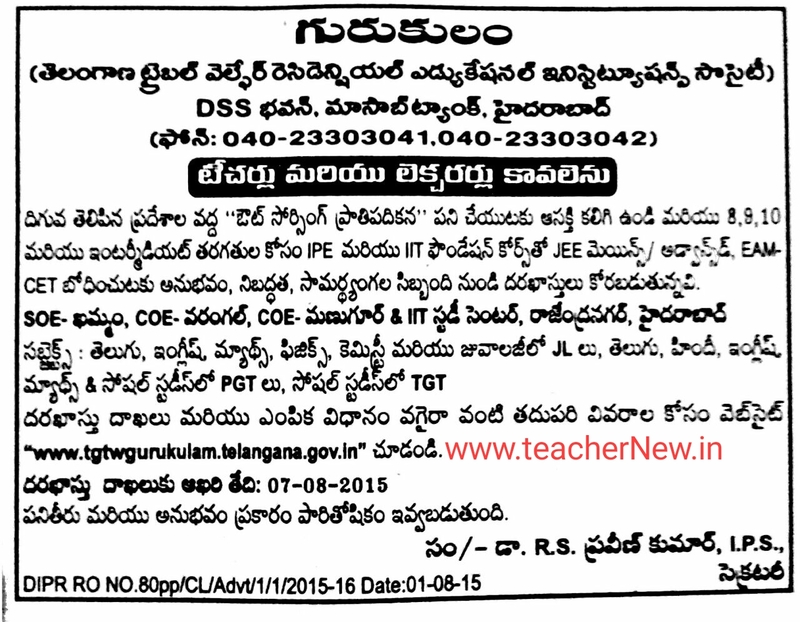 TSTWREIS Gurukulam Teacher Posts Last date 07-08-2015 for submission of applications through online is 07.08.2015. 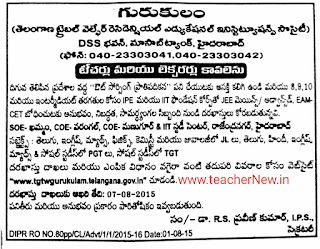 TSTWREIS Gurukulam Teacher Posts and Lecturer Posts 2015: Gurukulam, TSTW Residential Educational Institutions Society, Hyderabad Secretary, R.S Praveen Kumar, IPS has given Teachers and Lecturer Posts 2015 Recruitment notification 2015 on 01-08-2015 and TSTWREIS GURUKULAM invites applications from the experienced, eligible, devoted and interested Candidates for filling up the above said posts on outsourcing basis in the following Institutions of Excellence functioning in Gurukulam. IIT Study Center, Rajendra Nagar, Hyderabad. How to apply: Application form can be submitted through online to www.tgtwgurukulam.telangana.gov.in. A Screening Test and Interview will be administered and the date of screening test and interview for the selection of JLs/PGTs will be communicated shortly.